I steeped myself in flour tortillas. It was inevitable. 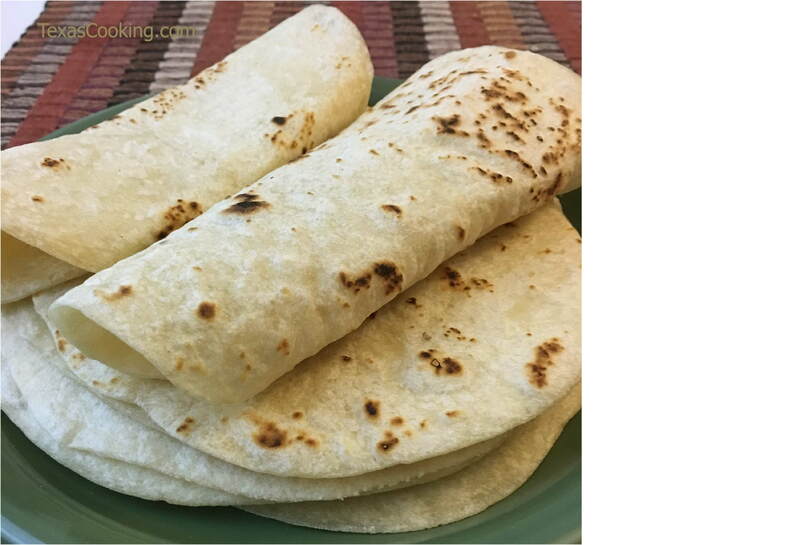 After the how-to article on corn tortillas appeared several months ago (see How to Make Corn Tortillas, I knew what would follow. The article was well received, but seemed merely to whet the appetites, so to speak, of many readers for the other half of the tortilla equation -- flour tortillas. My dilemma was that I had no personal experience with making flour tortillas and was, therefore, no expert. After wrestling with the problem (translation: I couldn't find anyone else to do the article), I concluded that our readers could benefit from a novice's experience with making these versatile and delicious flatbreads. So I steeped myself in flour tortillas -- the thick and chewy Texas kind, the thin and delicate Sonoran type, and many of the spiced and flavored varieties born in the imaginations of creative Southwestern cooks. I admit to having had a preference for corn tortillas which, no doubt, explains why I never made flour tortillas. And I still believe that the quality of flour tortillas generally available at supermarkets is superior to store-bought corn tortillas. But, once again, my efforts partially proved the adage that homemade anything is better than store-bought. To get started, I consulted some cookbooks -- the consistently excellent The Border Cookbook, by Cheryl Alters Jamison and Bill Jamison, the well-written and informative Comida Sabrosa, Home-Style Southwestern Cooking, by Irene Barraza Sanchez and Gloria Sanchez Yund, and the slim-but-informative El Paso Chile Company's Tortillas, by W. Park Kerr -- among them. My research revealed that flour tortillas originated in Sonora, a northern Mexican state which shares a long border with the US. Mexican cooks there had access to white flour and incorporated it in their tortillas. These tortillas have real body and taste; they are perfect for gorditas, fajitas and eating out of hand. Divide your dough into 8 balls of equal size, cover them, and let them rest again for about 20 minutes. Avoid letting them touch, if you don't want them to stick together. Dust your work surface with flour. Working one at a time, remove each piece of dough and pat it into a 5-inch circle. With a rolling pin, roll out the tortilla, working from the center out, until you have a 7- or 8-inch tortilla a little less than 1/4 inch thick. Transfer the tortilla to a hot, dry skillet or griddle. It will begin to blister. Let it cook for 30 seconds, turn it, and let the other side cook for 30 seconds. Remove the tortilla, place it in a napkin-lined basket and cover with aluminum foil. Repeat for the remaining tortillas. Rolling out tortillas in perfect circles is harder than it sounds. Do not use bread flour. You want flour with a low gluten content. You don't want to over-flour your work surface, but you don't want your rolled-out tortilla sticking to it either. I found that the dough adhered less to an unvarnished wood surface (like an old cutting board) than any other surface I tried. A flat dough scraper, known in baking parlance as a bench knife, is very efficient in removing the rolled-out tortilla from the work surface. When rolling out tortillas, dust your rolling pin with flour, and don't be afraid to apply pressure. Flour tortilla dough is pretty sturdy; but not to the point of rerolling. You don't want tough tortillas. The Border Cookbook recommends the use of a tortilla roller (similar to a short piece of broomstick), rather than a rolling pin. Rolling out tortillas in perfect circles is harder than it sounds; the dough wants to draw up. So if perfectly circular shapes are important, you can trim away the excess with a sharp knife. Once again, I believe a cast iron skillet or griddle is practically indispensable for making any kind of tortilla. A dry cast-iron utensil, unlike most other materials, can take high temperatures over a sustained period of time without being adversely affected, although you may have to do a reseasoning afterwards (see How to Love Your Cast-Iron Skillet). Once you get a rhythm going, you can roll out a tortilla, put it on to cook and, while it cooks, roll out your next tortilla. Seems like an arduous process but, with this method, I could produce 8 tortillas in about 10 action-packed minutes. Be sure to rewrap your fresh tortillas each time you add another to the stack. If you like, you can substitute one cup of whole wheat flour for one cup of the all-purpose flour. If you choose to experiment with seasonings, mix dry spices with the flour mixture and fresh or "wet" seasonings with the milk. My results with the above recipe were outstanding -- chewy, delicious, irresistible. My experience with the Sonoran variety, however, was less than spectacular. Mix the flour and salt in a large mixing bowl. Mix in the shortening using a fork, a pastry blender or your fingertips. Gradually add the water, working it in until you have a sticky dough. Turn out the dough onto a floured work surface and knead for 2 or 3 minutes. Allow the dough to rest, covered, for 15 minutes. Then divide it into 6 or 8 balls of equal size, cover, and allow to rest for 45 minutes to an hour. Roll each ball of dough, between sheets of waxed paper, as thinly as possible (between 1/16 to 1/8 thick) into a circle. Remove the waxed paper from one side of the tortilla, then, carefully, from the other side. Transfer the tortilla to a hot, dry skillet or griddle. Cook for 10 seconds, turn it, and cook for 10 more seconds, then turn again for 10 more seconds per side. Remove the tortilla, place it in a napkin-lined basket and cover with aluminum foil. Repeat for the remaining tortillas. Making the dough was easy. Making the tortillas was not. My equipment, unlike my skills, was right. Rolling the tortillas into nice circles between sheets of waxed paper was easier than I expected, but my optimism was short-lived. I found that the waxed paper on the first side comes away more easily if you tear it off in one swift motion but, no matter what I tried, I could not manage to coax the remaining waxed paper off the other side without mangling the tortilla or without the little demon drawing up to the size of a sand dollar. Curse that high-gluten flour anyway. I cooked them, anyway. But, since the thickness of the tortillas wasn't uniform, they didn't cook up very nicely. I consoled myself by eating one of my Chewy Tortillas with butter and salsa, and decided to share my failure with you readers.